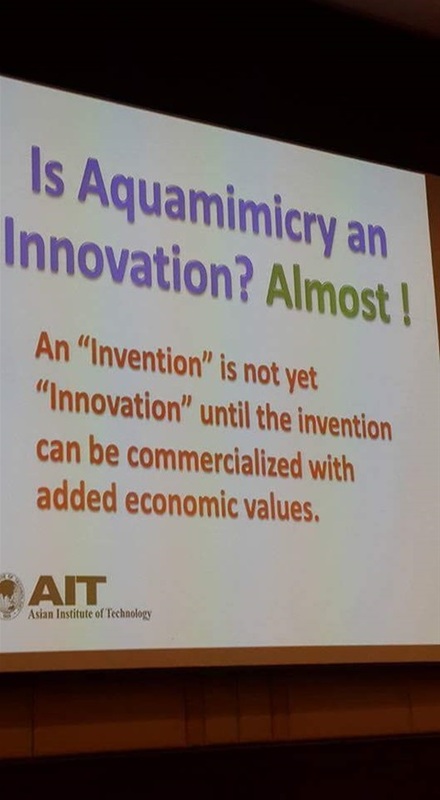 Aquamimicry has moved beyond sustainability. We have taken appropriate participation through the intervention of aquatic biology and with our synbiotics technology of nature designing to mimic the aquatic ecosystem in establishing an ecosphere of natural living organisms for the well development of the aquatic animals. We have reintegrated with the farmers to help them understand that they are integral part of nature and to work in symbiosis with his pond environment. We have imparted our technology selflessly to the famers so that their ponds are restorative enabling them to restart their next cycle. "Valuing Ecosystem Function higher than material things is the paradigm shift that determines whether we understand the meaning of our lives and survive or whether we remain ignorant and selfish and destroy our own habitat trying to gain more wealth or more power. If we reach this level of understanding, not only can everyone live on the Earth but the natural systems on Earth can reach their optimal ability to sustain life."